One winter's day, about the year 401, the snow lay thick around Sisan, a little town in Cilicia. A shepherd boy, who could not lead his sheep to the fields on account of the cold, went to the church instead and listened to the eight Beatitudes, which were read that morning. He asked how these blessings were to be obtained, and then, when he was told of the monastic life, a thirst for perfection arose within him. He became the wonder of the world, the great Saint Simeon Stylites, given by God in spectacle to Angels and men. He was warned that perfection would cost him dear, that it could not be attained without first conquering self. A mere child, he began the monastic life by learning the Psalter by heart, and thereafter passed a dozen years in superhuman austerity. He bound a rope round his waist until the flesh festered. He took food only once in seven days, and, when God led him to a solitary life, kept fasts of forty days. He desired solitude and spent three years as a hermit in a cabin at the base of a mountain. When he became a curiosity for many persons because of his extreme mortifications, he spent thirty-seven years on the top of a very high pillar in Syria, not far from Antioch, exposed to heat and cold, standing in prayer, never seen to lie down, nourished each week by the Holy Eucharist, day and night adoring the majesty of God. Perfection was all in all to Saint Simeon; the means were nothing, except in so far as God chose them for him. Certain solitaries of the region, hearing of him, were suspicious of a life so new and so strange, and sent some of their number to test him, reproving him for departing from the tested ways of the Fathers and choosing a path so original. 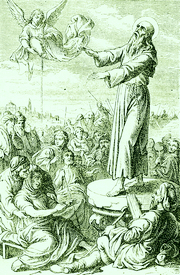 They bade Saint Simeon come down from his pillar and return to the common life he had left. In a moment the Saint made ready to descend, but the emissaries were satisfied with this proof of humility; they had been told to revoke the order if he was disposed to obey. Stay, they said, and take courage; your way of life is from God. Cheerfulness, humility, and obedience thus set their seal upon the inspired austerities of Saint Simeon. He obtained miracles for those who appealed to his prayers, and by his tears and supplications to God averted catastrophes he foresaw in vision. The words which God put into his mouth brought crowds of pagans to Baptism and sinners to penance. At last, in the year 460, those who watched from below noticed that he had been motionless for three whole days. They ascended, and found the old man's body still bent in the attitude of prayer; but his soul was with God. Reflection. Saint Augustine says, This is the occupation of our life: by effort and toil, by prayer and supplication, to advance in the grace of God, until we come to that height of perfection where with clean hearts we may behold God. He hath put down the mighty from their throne, and hath exalted the humble.